Since this week is flack Friday I thought would finally review this beast! I'm reviewing one tray at a time. 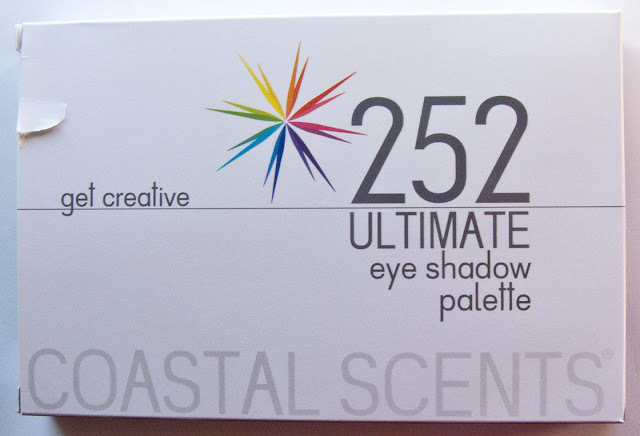 This Coastal Scents palette retails for $24.95 for 126.0g / 4.44 oz of product. 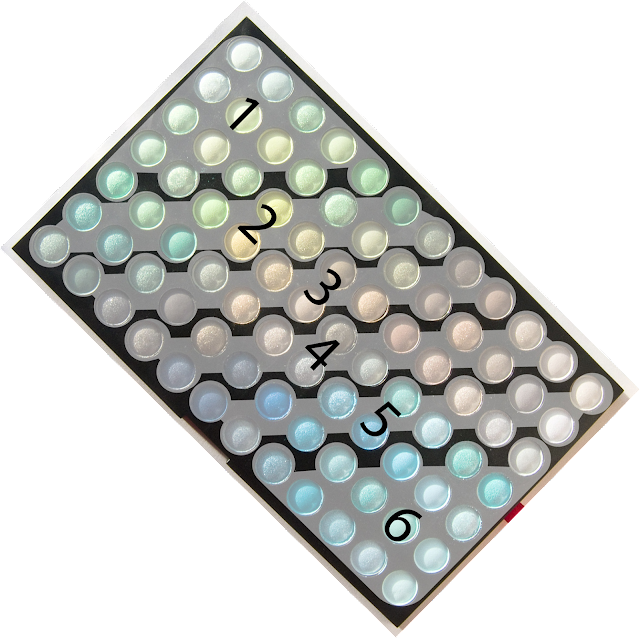 Palette dimensions are 8.75" x 5.80" x 0.90" (22.23cm x 14.73cm x 2.29cm). 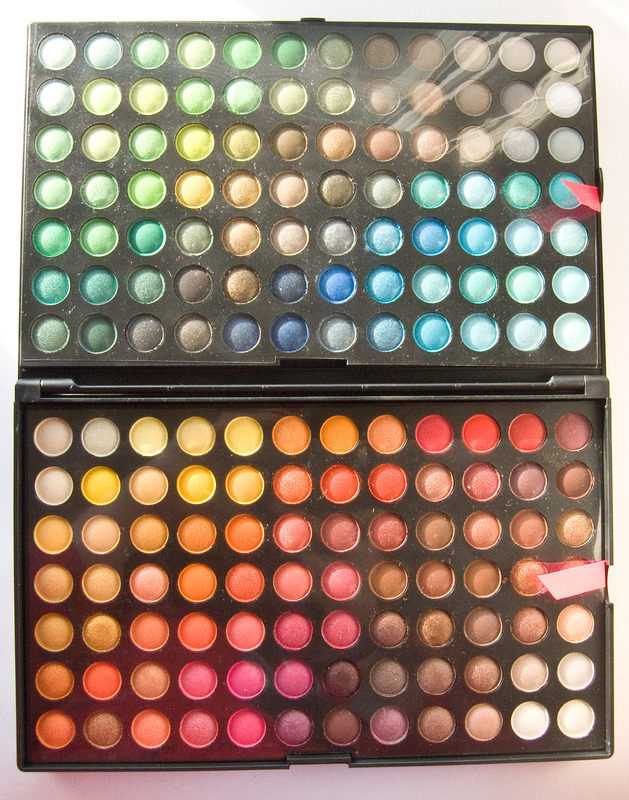 The pan diameter is 0.3" or 7.62 mm which are smaller then Yaby at 15.5mm for their eyeshadows. You can read the review for the colours of the Tray 2 and Tray 3 in the links. Plastic box to house the 3 trays. These eyeshadow fall under 3 finish with Coastal Scents Matte, Satin, Shimmer. 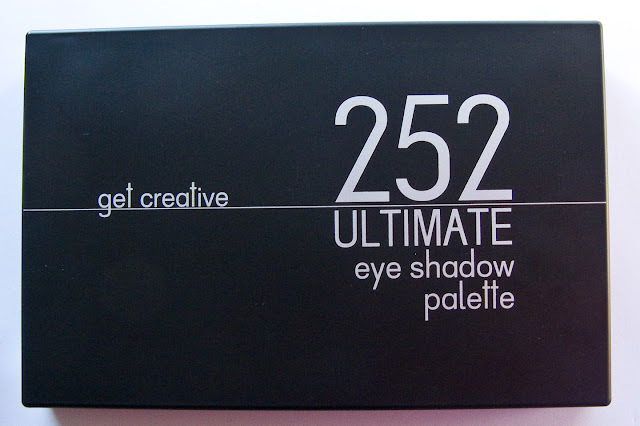 Mattes are solid flat or bordering a satin finish (matte with a dewy texture) the finish of these range from buttery to dry and a few sheer ones over all. The Satin finishes tend to be more pearl like in general the particles are super fine however but there are a few true satins in this category. There are also more semi-opaque shades in this category then the others. 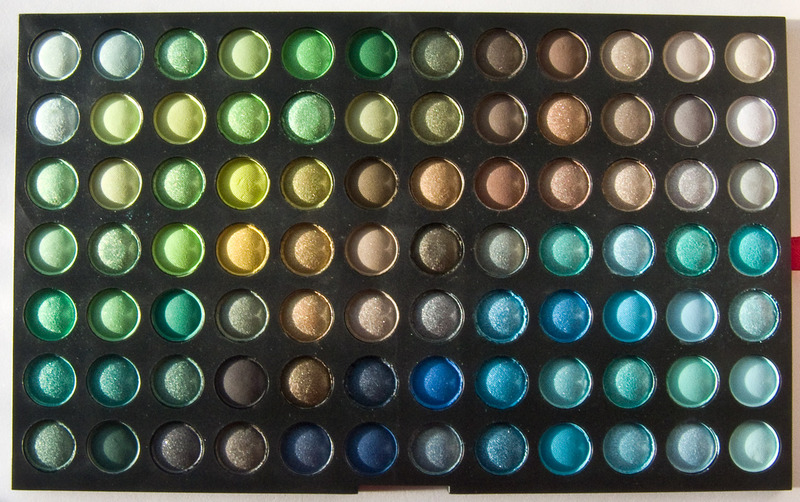 Shimmer cover all the frost, shimmer, and metallic finishes for each of the shades. The particle are larger but i found all of these shade richly pigment and buttery. Wear: 2 hours for the sheerest and 5-6 hours for most on there own. Packaging: Solid black box with 3 trays that can be pull out with a ribbon and has a clear plastic sheet divider. Section swatches order from left to right on a 60 degree angle upwards. Tray 1. Sea Foam is a pale pastel mint green hue with a satin. Minty Fizz Is a pales pastel turquoise with a frost finish. Finish : Is labelled as Shimmer but this one is frost. 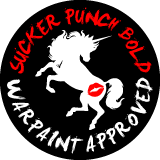 Application : Is labelled as Sheer but the colour payoff is really good on this on on it's own. Mint Condition is a frosty pastel green teal with a pearl finish. Finish : Is labelled as Satin but this one is pearl. Celery Ice is light bright green that leans slightly yellow with a frost finish. Application : Semi-Opaque but really a Opaque shade. Mellow Yellow is a vibrant chartreuse green with a matte finish. Amazonian Ice A bright leaf green hue with an metallic finish and light yellow shimmer. Snow Pea is icey pale leaf green with a satin almost pearl finish. Honeysuckle is pastel chartreuse with a satin finish. Fresh Pear is a light yellow green with a satin finish. Finish : Matte that is a satin. Appletini is a muted light yellow leaf green hue with a matte finish. Tropic Green is an bright green hue with a pearl finish. Limeade is a lime green with a of golden shimmer. Peridot A is a light grass jewel tone green with a shimmery finish and a subtle golden yellow sparkle. Spring Fever is a light lime green with shimmer. Finish : Shimmer but more of a frost. Limelight is a bright yellow undertone green with a pearl finish. Laguna Green is a tropical blue green hue with a shimmery finish. Honey I Dew is pale green hue with that almost matte but with a pearl finish. Fluorescent is a luminous yellow base green hue with a pearl finish. Python Green is a vivid yellow-green with a matte finish. Emerald Ice is a high shine emerald green shade with a shimmer almost metalic finish. Prehistoric Green is a earthy forest matte green shade. Grape Vine is a high shine golden-green shade with a shimmery finish. Jewel Teal is a aslightly more blue based green thats' starting to lean teal with a frost finish. Fresh Chive is a rich blue based green with a matte finish. Fairy Gold is a bright shimmering golden yellow with an alsomost metallic finish. Sage Sensation is light golden olive shade with a shimmery finish. Hoppin Jalapeno is a dusty yellow green with a matte finish. Forest Eve is a burnished deep olive green hue with a shimmery finish. Pinehurst is a deep forest green hue with a matte finish. Herbal Green is a bright forest green hue with a pearl finish. Slate Green is a rustic deep green hue with a frost finish. Golden Avocado is a rich antiqued golden green with a pearl finish. Olivewood is a khaki olive brown with a matte finish. Balsam is a a bright golden-green with a pearl finish. Gypsy Night is a warm tone gunmetal with a shimmery finish. Opal Black is a rich charcoal black with shimmering sparks. Burnished Brunette a burnished deep brown with a matte finish. Dark Goldenrod is a rich golden hue with a bright shimmer finish. Bermuda Sand is a silky light brown-taupe with a satin finish. Bungalow Gold is a light bronze hue with an metallic finish. Finish : Shimmer but more like a metallic. Brownstone is a neutral medium brown with a matte finish. Timeless Taupe is a rustic brown with a matte finish. Thunderous is a deep gunmetal taupe hue with a pearl finish. Kodiak is a golden brown with a touch of green to the base and has a pearl finish. Bazaar is a frosty taupe. Dark Golden Olive is a deep burned brown green with micro gold sparks. Deep Cider is a rich warm brown matte base with micro golden sparks. Golden Sienna is a metallic sienna with gold sparks. Ashen is light grey-taupe with a pearl finish. Tanzanite is a rich deep velvet blue with a pearl finish. Rainstorm is a deep midnight blue shade with a pearl finish. Platinum Blue is a deep metallic silver-blue hue with a metallic finish. Niagara is a like a acid was bluish-green with a frost finish. Finish : Shimmer but more like a frost and almost duochrome. Cherry Moss is a reddish brown with subtle light green iridescence. Finish : Satin but more like a pearl and almost duochrome. Gypsy Stone is a smokey titanium taupe with a pearl finish. Wishy Washy is a muted light grey with a satin finish. Indigo Dream is an intense navy with micro silver sparks. Capri Blue is a true blue shade with a pearl finish. Blue Zircon is a is bright blue with a pearl finish. Pacific Opal is a bright teal with a pearl finish. Aluminum Taupe is a antique pearl with a shimmery finish. Ash Grey is neutral medium grey with matte finish. Arctic Breeze is a sheer wash of light grey with a satiny finish. Lakeshore is a mix of gold, green, and nautical blue. Caribbean is a vivid blue shade with a pearl finish. Calypso is a lush blue shade with a pearl finish. Glacier Blue is icy pure blue with a frost finish. Alpengeist is a frost platinum with a metallic-shimmer finish. Summer Rain is a frosty sheer bluish grey with a pearl finish. Mazarine Blue is a sueded nautical blue with a micro shimmery finish. Mali Blue is a pacific blue shade with a pearl finish. Vibrant Blue is a bright aqua blue with a matte almost satin finish. Persian Green is a tropical turquoise shade with a pearl finish. Coastal Cliff is a dusty blue grey with a satin finish. 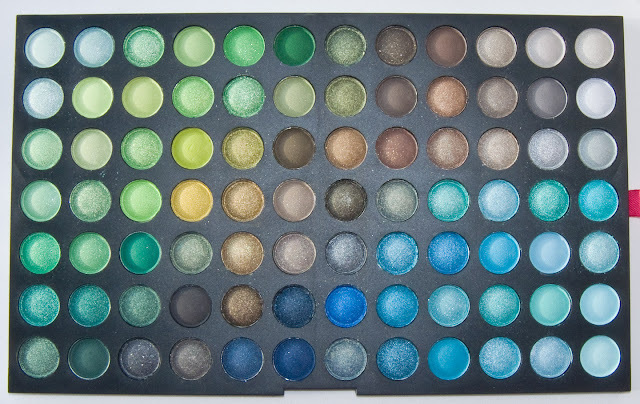 Empress Teal is a rich blue-green turquoise hue with a matte finish. Island Breeze a metal foil turquoise/teal with a shimmery finish. Icicle Blue is a soft baby blue shade with a matte finish. Blue Hawaiian a rich blue/green with a pearl finish. Azure Frost An icy burst of blue with a shimmery finish. Sea Lily is a wispy turquoise with a soft, matte finish. Cyan Frost is an icy pastel blue shade with a shimmering finish. Aqua Mist a gentle blue with a frost finish. Sky Blue is a light turquoise blue with a sheer matte finish. Sea Spray is a wash of pastel blue with a matte finish. 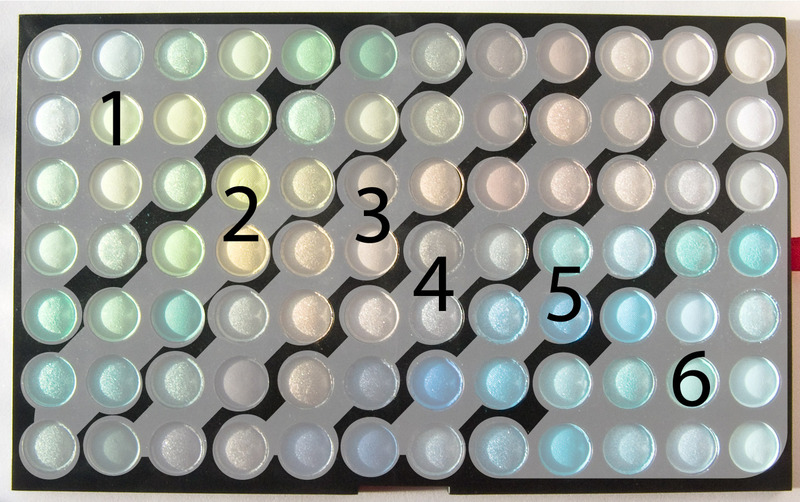 Tray 1 is a really solid cross section of matte, satin, pearl, frost, shimmer and metallic from the green, khaki, taupe, and blue hues. The few of the sheer shade in this tray are appropriate for the colours them self but most can be built up on base for better colour payoff.